Dates and oranges go together like “peas and carrots,” as Forrest Gump would say. Here I’ve marinated chicken in freshly squeezed orange juice with hot sauce, mustard and thyme to give the chicken a depth of flavor. It’s not at all spicy; the hot sauce and mustard give the chicken a nice robust flavor, but it’s not overpowering. Then, during roasting, I basted the chicken with multiple layers of date honey to create a brown, bubbly, sticky skin. 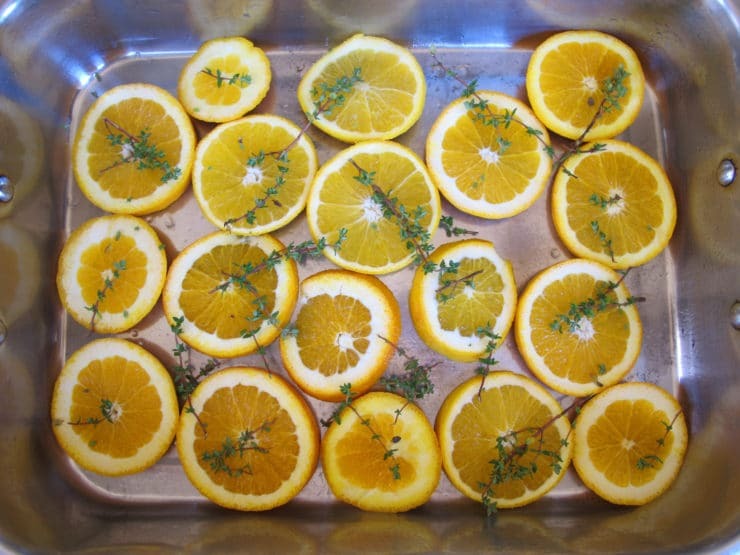 The combination of citrus, thyme and date flavors is truly unique, and the presentation with fresh orange rounds and thyme is so pretty. I’m thinking this would make a really fabulous Rosh Hashanah entree! 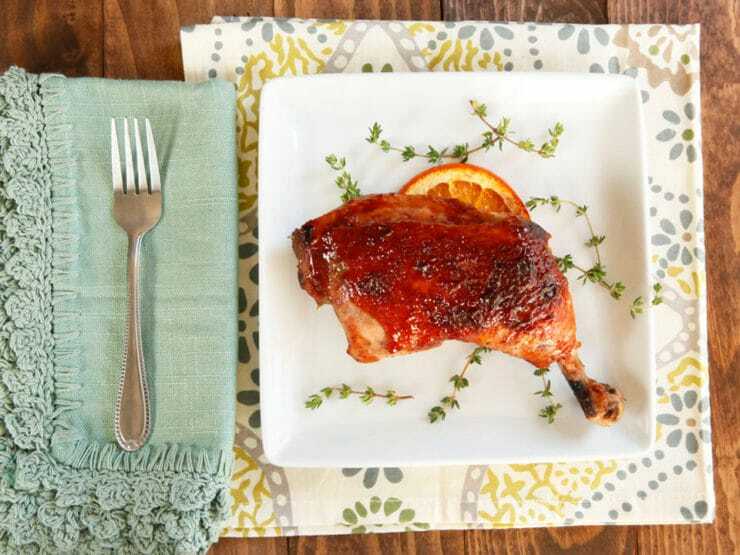 Sweet, flavorful recipe for orange and thyme-marinated roasted chicken glazed with date honey. Lovely holiday recipe. 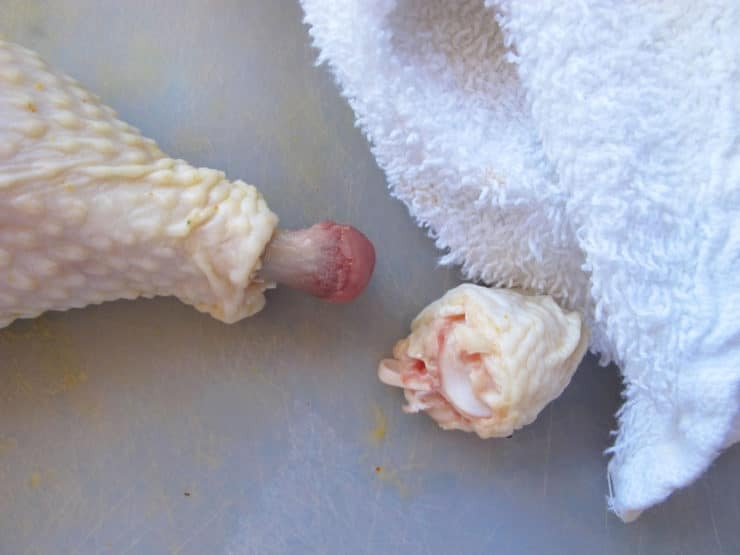 If using chicken leg quarters, I generally like to remove the "knuckle" end of the drumstick bone before cooking. It makes for a more elegant presentation on the dinner table. To do this, use a sharp chef's knife to carefully slice around the bottom knuckle of the bone, cutting through the skin and tendons. Then, grasp the cartilage area with a towel and pull strongly, twisting to remove it, and discard. FYI, this may take some practice and a bit of elbow grease. Be very careful with the knife when you are making the slice around the bone-- you don't want to slip! Whisk together orange juice, hot sauce, 3 tbsp olive oil, mustard, orange zest, 1/2 tsp salt and pinch of black pepper to form a marinade. 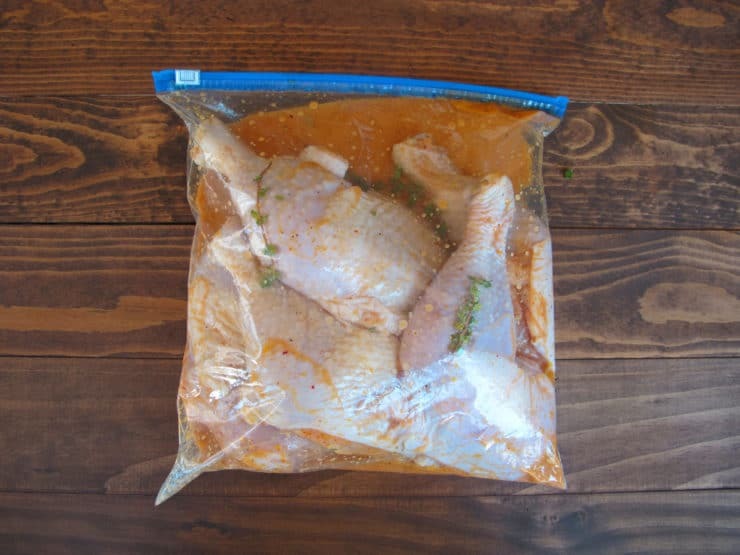 Place chicken pieces into a plastic zipper bag or into a ceramic or glass dish. Pour marinade over the chicken and add 6-8 sprigs of thyme. Seal the bag (if using) or cover the dish with plastic wrap. Marinate in the refrigerator at least 3 hours, up to overnight. 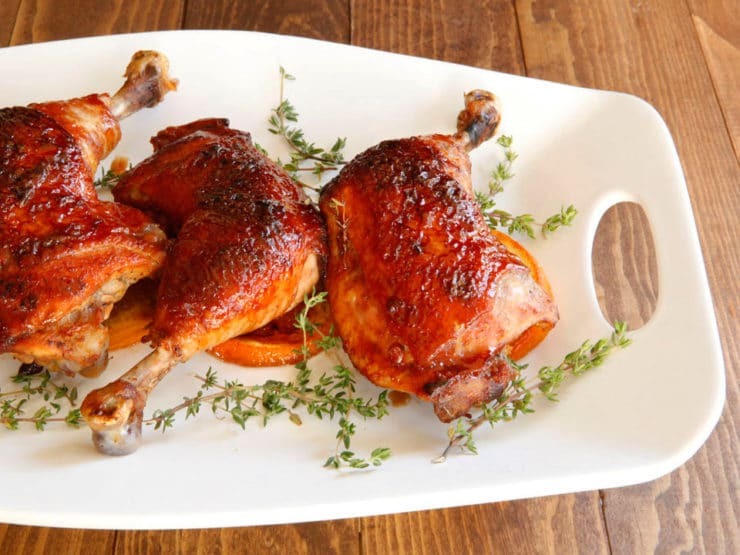 Preheat oven to 475 degrees F. Remove chicken from marinade and discard the excess marinade. Heat 1/2 cup olive oil in a nonstick skillet over medium until hot but not smoking. Add the chicken pieces skin side down, three pieces at a time, and let them cook for 5-10 minutes until the skin is nicely browned. Remove from skillet and repeat with remaining 3 pieces. Remove the skillet from heat. Lightly grease a roasting pan or dish. Slice two of the large navel oranges into rounds and lay them on a single layer, covering the bottom of the pan. Sprinkle some thyme sprigs into the bottom of the roasting pan as well (reserve some for the final platter/garnish). 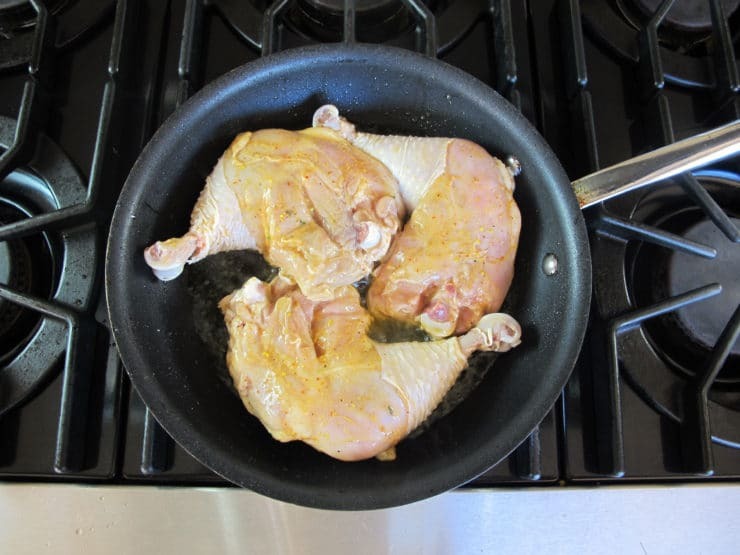 Place the chicken back into the pan, skin side up. Brush each piece generously with date honey. Cover the pan tightly with foil and bake 45 minutes, basting the chicken every 15 minutes with more date honey. After 45 minutes the chicken should be cooked through and internal temperature should be at least 165 degrees F (I usually cook it to 170). If not, re-cover and continue to cook until it reaches temperature. Uncover the chicken. Baste once more with remaining date honey. increase heat to 500 degrees F and cook for 5-10 more minutes until the date glaze is bubbly and shiny. Keep a close eye to make sure the glaze doesn't burn, it contains a lot of natural sugar and will blacken if you're not careful. Slice up the remaining orange. 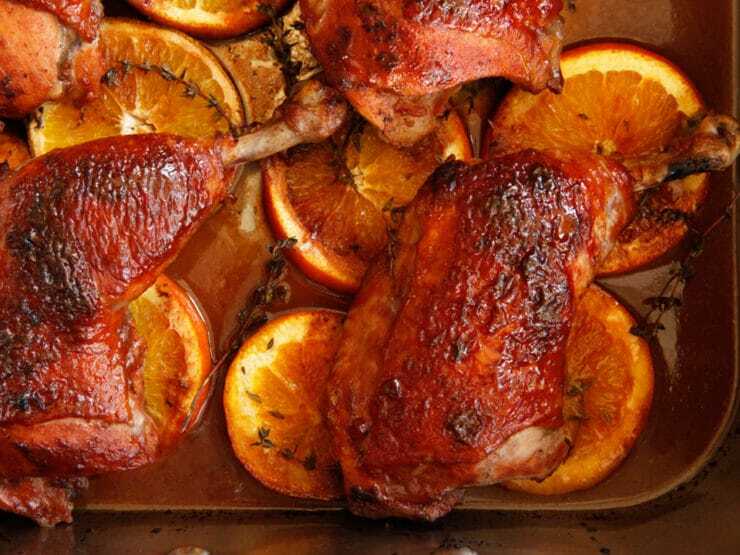 Serve each piece of chicken garnished with a fresh orange slice and fresh thyme sprigs. Can any other type of honey/syrup be used? If so, what kind? Agave works. Regular honey works too, but reduce the amount a bit because it’s naturally sweeter than date honey. Quick question: if I double the recipe, how should I adjust the oven temp/cooking time? Hi Liz! Oven temp will be the same, but it may take a bit longer to cook the whole batch. Just make sure you use a thermometer to check both dishes of chicken, they each need to reach 165-170 degrees Fahrenheit internally before increasing the temperature for browning the glaze. I am making this for tomorrow and I realized that the oil amount is a bit confusing. Is it 3 tbsp in the marinade and the 1/2 cup for the frying? Happy new year Julie! It is 3 tbsp oil in the marinade and 1/2 cup for frying. Enjoy! Can this dish be made with purchased date syrup? If so, would you alter the amounts? 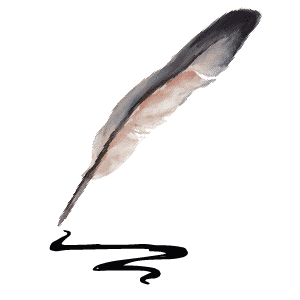 S Spie – yes you can, and the amounts would be the same. Enjoy! Hi Danielle, Tori’s assistant Ashley here! Unfortunately I wouldn’t suggest leaving out the mustard. I’ve read that some folks replace mustard with horseradish sauce or Worcestershire sauce in recipes, though I can’t say for sure how those flavors would work in this particular recipe. Sorry I can’t be of more help! Hi Tori. Can this delicious sounding dish be prepared ahead and frozen? Hi Beryl, I do not recommend freezing meat on the bone, so this would not be a good candidate as a make-ahead-and-freeze dish. Hello, i have a question about the hot sauce. Does it make the dish too spicy for children to eat or is it suitable for them and looses its “hotness” once cooked with the other ingredients of the marinade? Tori, I am a home health aide who works with the elderly, and am fortunate to be working with a 99 year old jewish woman. I’m going to make this for her on Christmas day ( I already made the honey-delightful!! ) I was thinking about roasted dill carrots and Kasha Varnishkes with mushrooms, that my step bubbe used to make for me. Would this menu work, or do you have any other suggestions. Thank you for your time and advice to a fellow Shiksa!! Do you have to brown the pieces before roasting? Sharon, if you want the skin to be brown, crisp and pretty like it is in the picture, then yes I do recommend browning first for best results. Made the lazy girl’s version of this. Boiled the dates and then pureed them in the food processor with water. Recipe the followed as written. Still yummy! Can I do this in the crockpot??? If so, any modifications? This looks fabulous … I just need to cook while I’m at work before Yom Kippur fast. Hi Edna, unfortunately I do not recommend making this in the slow cooker. The glaze will not have nearly the same appeal; it really needs a dry hot oven to turn out tasty. Tori — it came out amazing. I can’t wait to taste it…it’s smells so very good! There was a lot of liquid in the pan, so when it came time to take off the cover, I took some of the liquid out and I’m reserving it to use as a gravy for later. I used the whole 10 minutes at the end and got a really perfect color on the chicken. I wish I could attach a picture!! Fabulous Michelle! 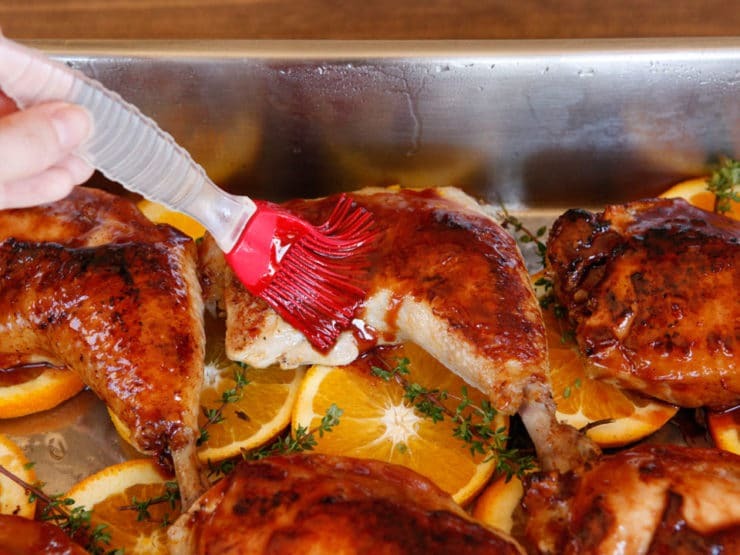 That glaze really does create a gorgeous color on the chicken. I feel like it’s the way date honey was meant to be used! I’m making this as I type. It smells SO GOOD!!! I’m excited to make this chicken for Rosh HaShanah! How far in advance can I marinate the chicken? Can I do it today (Monday) to cook on Wednesday? This recipe looks AMAZING- what’s your thoughts on using chicken breasts?? Do you think it’ll be dry?? I’m not a big fan of breasts personally, because as you say they can be dry. That said, if you use bone in, skin on you’ll have a better chance of a tasty result. You can start checking if they’ve come to temperature around 40 minutes (covered)– with breasts you run a greater risk of overcooking, so best to uncover them as soon as they get to food safe temperature for that final baste/browning. Good luck! Thanks for the recipe, I am going to prepare it for Rosh Hashanah. One question, which kind of hot sauce do you use or recommend? Any standard hot sauce is fine. I tested it with Tapatio, but if you have another favorite brand feel free to use. Thanks you for this great looking recipe I am going to try it for RH. I bought some Silan a while ago and didn’t know what to do with it. Fabulous. thank you again. Now I need to look up your recipes with Harissa and Miso, as i bought that also and don’t know what to do with it. Looks wonderful. Can this be made a day or so ahead. Just pressed for time for the feasts and would be good if it will still be really good. Hi Gail– the glaze is really best when freshly cooked. If it were me I would make this the day of and try making some other dishes ahead. A new and intriguing recipe to add to my autumn repertiore. Thank you, Tori! Do you know where to buy Israeli silan (without added sugar) in the United States? Was trying to decide how to make my meal on Wed. THX!!! Shouldn’t you be napping after that awesome dinner you cooked yesterday? Looks gorgeous, and sounds like a very tasty centerpiece for a Rosh Hashanah feast! That glaze would go wonderfully on quail, is that something you eat? I think that I will make that for the High Holidays! Yummy! Shabbot chicken dinner! Winner Winner! Enjoy your special evening!